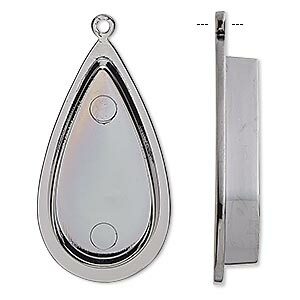 Focal, gunmetal-plated "pewter" (zinc-based alloy), 36x20mm teardrop with 28x14mm non-calibrated teardrop setting. Sold individually. Item Number: H20-A3472FN Have a question about this item? Machine-made, solid back, non-calibrated bezel offers consistent size, shape and finish. 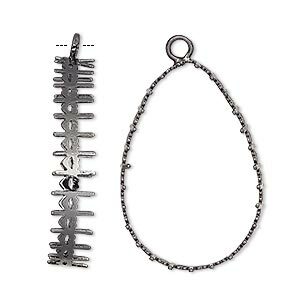 Plated "pewter" bezels with deep wells support design flexibility. Create your own multi-layered designs with Apoxie, Polyclay or ICE Resin® for one-of-a-kind drops and focal components. 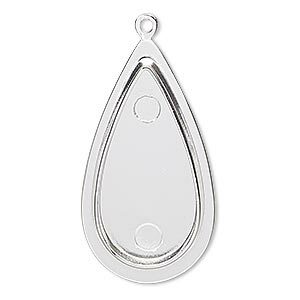 Focal, gold-plated "pewter" (zinc-based alloy), 36x20mm teardrop with 28x14mm non-calibrated teardrop setting. Sold individually. 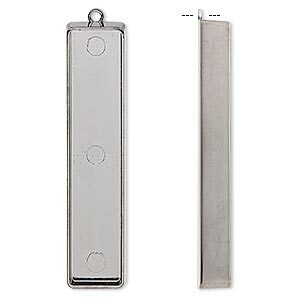 Focal, gunmetal-plated "pewter" (zinc-based alloy), 56x13mm rectangle with 54x11mm non-calibrated rectangle setting. Sold individually. 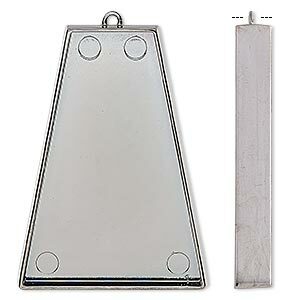 Focal, gunmetal-plated "pewter" (zinc-based alloy), 46x33.5mm trapezoid with 44x30mm non-calibrated trapezoid setting. Sold individually. 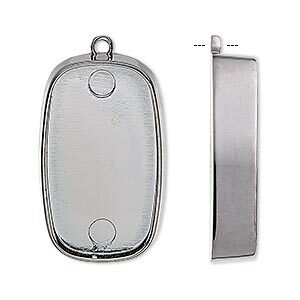 Focal, gunmetal-plated "pewter" (zinc-based alloy), 30x18mm rounded rectangle with 28x16mm non-calibrated rectangle setting. Sold individually. 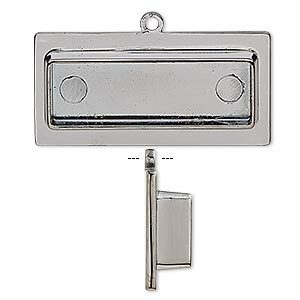 Focal, gunmetal-plated "pewter" (zinc-based alloy), 35x17mm rectangle with 29x9mm non-calibrated rectangle setting. Sold individually. 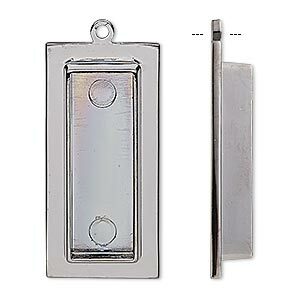 Focal, gunmetal-plated "pewter" (zinc-based alloy), 35x17mm rectangle with 27x9mm non-calibrated rectangle setting. Sold per pkg of 2. 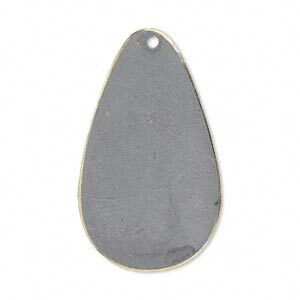 Focal, brass, earth tone grey patina, Pantone® color 17-5102, 34x20mm double-sided teardrop. Sold per pkg of 6. 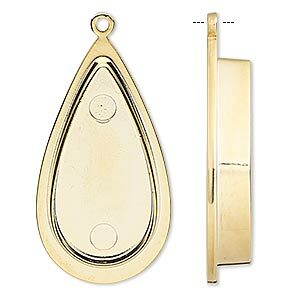 Focal, gunmetal-finished brass, 30.5x22mm teardrop with open back and decorative trim, 30x20mm pear bezel. Sold per pkg of 4. 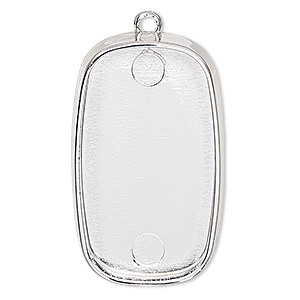 Focal, silver-plated "pewter" (zinc-based alloy), 30x18mm rounded rectangle with 28x16mm non-calibrated rectangle setting. Sold individually.